The first and most common option that implements geocache downloading functions into Locus Map. Select any point of interest > detail screen > bottom panel > add-on button > nearest caches - searches for geocaches around the POI. you may need to empty the import folder before downloading caches to save place in your device memory so check the option. Locus Map Pro users may also let Locus fill altitudes of the imported caches. Geocaches appear on the map. Basic members see traditional caches only. Each geocache has its own unique GC code. Use this feature to import particular geocache according to its GC code. For more information check manual of Geocaching4Locus. Pocket Query, also known as “PQ” or just “query”, is a GPX file with geocaches that was rendered at Geocaching.com according to instructions from the user. For example it is possible to define all geocaches with difficulty grade 3 within a circle of a certain radius around given GPS coordinates. After a few minutes of processing the created file is available in the tab “Pocket Queries Ready for Download” in users Geocaching.com profile or the rendering can be postponed on particular time in future. Pocket Query can contain <1000 geocaches only. Locus Map can also handle .zip files - to reduce the query file size check this feature. This option is available only to Locus Map Pro users. This add-on provides connection between GSAK database where geocaches are saved, and Locus Map. Locus Map can display all your GSAK geocaches, manage final waypoints, view listings etc. And everything offline. Add this addon to the function panel and tap on it. or long-tap on map, select last icon in bottom menu – Settings and select Load GSAK geocaches. Locus GSAK add-on is no longer developed and may cause issues on newer versions of Android or Locus. This add-on provides connection between GeoGet database where geocaches are saved, and Locus Map. Locus Map can display all your GeoGet geocaches, manage final waypoints, view listings etc. And everything offline. or long-tap on map, select last icon in bottom menu – Settings and select Load GeoGet geocaches. 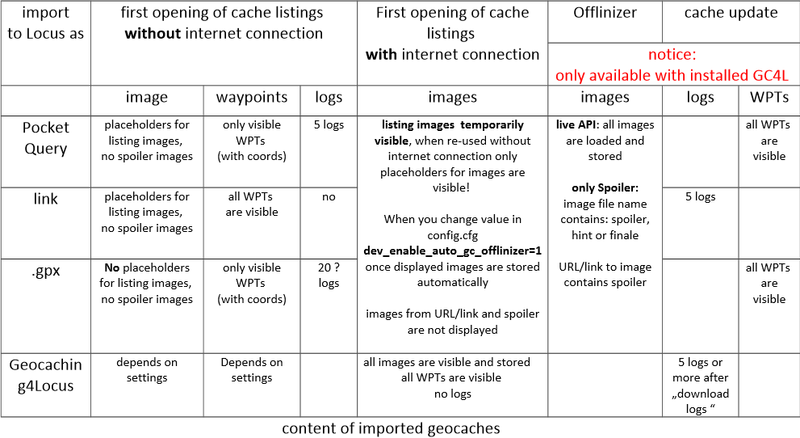 C:GEO is an open source, full-featured, unofficial client for Geocaching.com and other geocaching platforms like Opencaching. 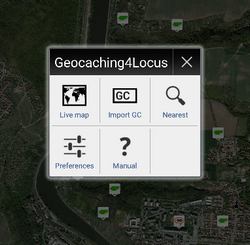 Its most important feature is ability to download any number of geocaches of all sorts and export them to Locus Map. install also Google Maps if necessary. C:GEO will not run without them. Active map - geocache icons are displayed online above a map. Shift the map to desired area, geocaches appear above the map. The frame of your device screen defines the area of which all visible geocaches will be saved.